← mary’s magnificent pastry – just in time for pie season! TIP: Make sure the cheese is soft or else you will get lumps of white cheese in your nice pumpkin-coloured cheesecake! TIP: The pecans really enhance the flavours of this dessert. use them raw or toast them lightly in a 250 degree oven. Heat oven to 350 degrees and line the bottom of a 9-inch spring form pan with parchment paper. In mixer, blend together softened cream cheese and sugar. Add pumpkin and spices and mix until combined and smooth. TIP: If you just couldn’t wait for the cheese to soften 🙂 and you do have lumps, a hand blender will take care of most of them for you. To make the crustless cheese cake, pour the mixture into your pan and bake for 45 minutes, or until centre is almost set. If you are using a crumb crust (recipe below), pour the filling over the crust and bake for 50 minutes, or until almost set. Remove from oven. Cool on counter, cover with a clean tea towel and refrigerate for at least 4 hours. TIP: Make this a day ahead if you have time. The pumpkin and cinnamon flavours come out better the longer the cake sits. 1 1/2 cups gluten free “graham” cracker crumbs. We use Kinnikinnick brand. Mix together crumbs and spices. Add melted butter and stir until combined. Press firmly into the bottom of a 9 inch spring form pan, cover with filling and bake. 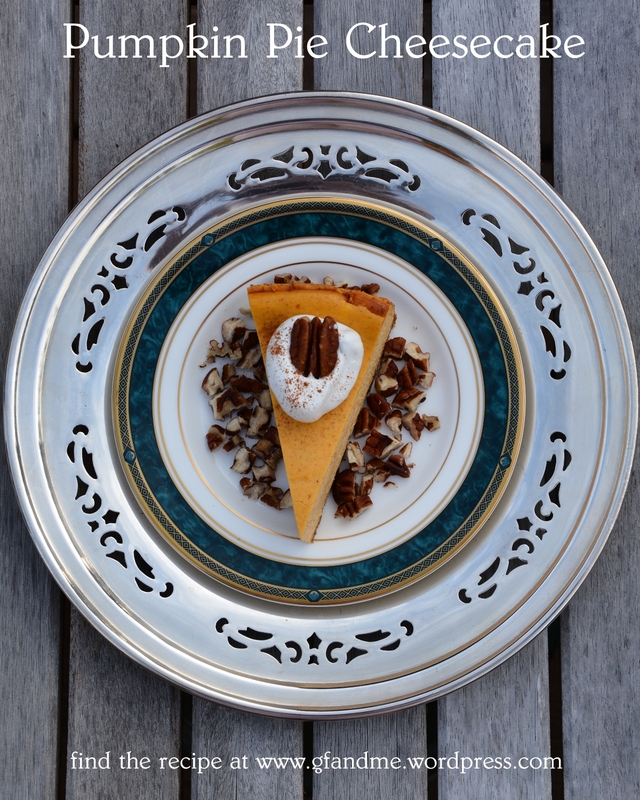 This entry was posted in Baking, Drinks & Desserts, Recipes and tagged celiac, Cheesecake, GF, gluten free, kinnikinnick pumpkin, pastry, thanksgiving. Bookmark the permalink. Thanks! Originally I set up a formal dinner party setting but the cake itself just disappeared. So, I went in the opposite direction and used an old outdoor table for a backdrop. I really liked the juxtaposition of the china and silver and the weathered wood. I really love the picture you have taken. Great! Looks delicious! Sounds awesome. I have a question about the pumpkin, did you have to blot it with paper towels to remove any of the moisture? Or was it OK? Thanks rural route lupiac. I did have fun with this one! YUM! Am so making this recipe. You inspire me to greater things all the time 😀 Thank you. Wow! Thanks so much. I hope you enjoy it as much as we do. It’s good fresh, but it’s great after a night in the fridge, so try to make it a bit ahead of time. Let us know how it goes. I can’t wait to try this and your pumpkin tarts and some of the other recipes. Especially with Thanksgiving coming. They sound yummy! I am so into pumpkin right now! And cheesecake is one of my favorite foods – this should be divine! I like to use a crust of ginger snap cookies (gluten free of course) and pecans ground up with cinnamon, a little butter, and a bit of coconut sugar. I’m thinking it would be perfect for your pumpkin cheesecake recipe. I think I’ll have to practice with it a few times before I serve it up on Thanksgiving! Thanks so much for all the great recipes. Thanks for the link and the great review! So glad you enjoyed the cheesecake. This looks great. I’d like to try and make a low-cal version of your crustless option. Are you okay with that? If it works out, and I post the recipe, I’ll make a big deal about the original coming from you. What do you think? I LOVE the idea. Could really use fewer calories right about now! I’m not sure if this will automatically ping back, but here’s the “lighter” version of this cheesecake: http://sweetpeasandsoybeans.com/2013/11/04/pumpkin-cheesecake-with-maple-whipped-topping/. It’s probably not as sweet, but I loved it (the guilt free part probably helped with that). Thank you for such a great recipe to work with. You’re welcome and your low calorie versions looks fantastic!